If your interior light cluster in your Nissan Micra K12 is not working fully then this guide may help. I found that my interior lights would not come on at all when opening the car doors even when the cluster switch was in the correct position. I could move the overhead switch manually which would activate the interior lights but they would not work when the switch was in the auto/door activation position. So I decided to investigate the problem and found the cause was quite simply a connection problem which was very easy to fix. If your light cluster is not working correctly then this guide will hopefully help you. Here is the simple process that I did to remove and fix the light cluster. 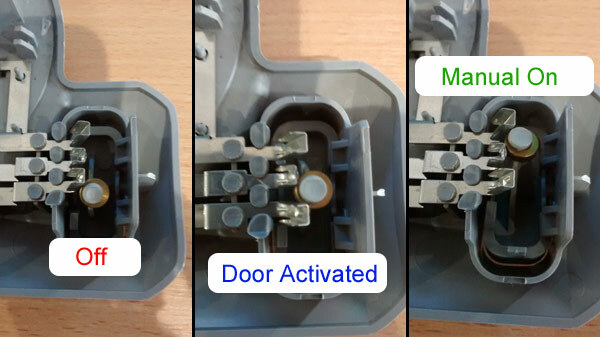 It is advisable to disconnect the battery for this process as you will be removing the light cluster which will involve disconnecting the electrical connector from the cluster. Warning: Please check that you have your radio code handy as you will need to enter it once you have reconnected the battery later in this process. Once the battery has been disconnected then proceed to the next step. Warning: If you proceed without disconnecting the battery then there is a risk of electrocution especially if you use a metal object such as a screwdriver to remove the cluster from the roof lining. To remove the light cluster from the root lining simply either use a trim removal tool or you can simply and gently prize the cluster out with your fingers or very carefully with a flat blade screwdriver. Warning: Be very careful if you use a screwdriver as you can damage the roof lining or the plastic cluster itself. Once you have pulled out the light cluster from the roof lining it will be hanging from the electrical supply. Disconnect the electrical connector at the location shown in the image below. The connector is held in place by a small clip that you simply press which allows the connector to be easily removed. Because my lights would not work on the door position on the switch it was evident that this problem was caused by some kind of connection issue. If your light cluster is not working at all then it's best to check the bulb is securely in place and the bulb connector is establishing a full connection. 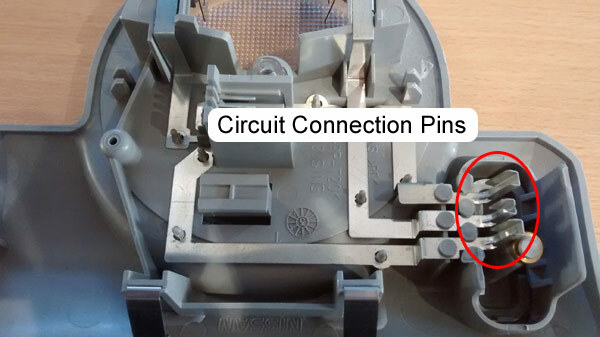 If your light cluster is not fully working then check the circuit connection pins as shown below. Check that the brass ring on the switch position arm establishes a tight connection at each of the switch positions. The image below shows each position of the switch arm and what action they represent. 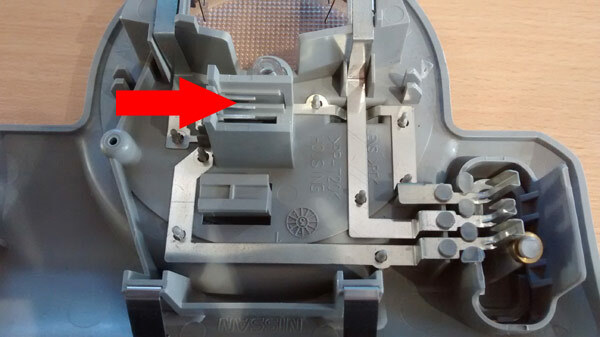 If you move the switch and the button is a little loose or does not feel firm when moved to the desired position then it is a clue that the circuit connection pins have bent out of place and are not establishing a connection correctly. 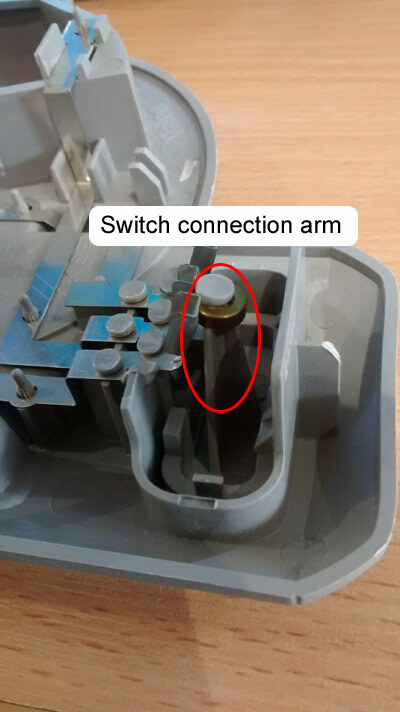 I found that the circuit connection pins were not establishing a connection with the brass ring on the switch arm when in the door activated position. Warning: Do not bend the circuit connection pins too far and gently use a pair of needle nose pliers to bend the pins into a better position. Also do not use too much force otherwise you risk snapping the pins or snapping the assembly from the plastic cluster. Move the switch to the off position as shown in the image above. Gently bend the circuit connection pins into a better position. Do not bend too far. Only bend the pins at the point that they are already bent from. They only need to be bent a small amount. Bend the pins a little at a time and with minimal pressure. Test the switch at each pin bend to test that the switch is firmer and more secure that previously. Once the switch is firmer and more secure than before then this should have fixed the problem. Reconnecting and refitting the light cluster is just really this guide in reverse from step 3 back to step 1. Now that you have refitted the light cluster and reattached the car battery you can now test that the switch and light cluster now works in all of the switch positions. Mine worked perfectly after bending the pins into a better position. The pins tend to bend out of place over time especially when the switch is left in either the door activated or manual on position as the switch puts pressure on the circuit connection pins when connected. Tip: Don't forget to enter your radio code if you disconnected the car battery during this process.